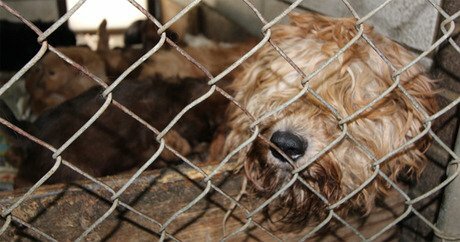 Nearly 100 dogs and puppies have been seized from a suspected puppy mill in Livingston County, Michigan after a number of anonymous tips led local authorities to investigate. What they discovered was enough to prompt law enforcement agencies to serve a warrant and pull the neglected animals from harm. On Wednesday, Livingston County Animal Control, sheriff’s deputies, and a rescue team from the Humane Society of the United States (HSUS) raided the Howell, Michigan property, where they found mostly large-breed dogs, including many Poodle mixes, living in deplorable conditions. The dogs had been living in their own filth, their hair severely matted to their skin. Many were suffering from untreated health problems, such as eye conditions and dental disease, the HSUS reports. A number of adult cats and several litters of kittens were also removed from the property. Officials discovered evidence the pets were being sold online. The owners of the alleged puppy mill have since been charged with counts of animal cruelty. All of the rescued pets are now being cared for at a temporary shelter where they are finally receiving the TLC and veterinary attention they so desperately need. They will remain at the shelter pending the court case against their former owners. Puppy mills are a big problem in the state of Michigan, Fritz says. To help save more animals like the ones rescued Wednesday, HSUS is currently working with state legislatures to pass Senate Bill 560, a new measure that would require breeding facilities with 15 or more female dogs to register and apply for licensure with the state. The new law would also mandate minimum standards of care for animals at these facilities. While nearby states like Indiana, Wisconsin, Ohio, and Illinois propose and enact harsher laws to combat the prevalence of unscrupulous breeders in their states, Michigan currently has no laws on the books to regulate large-scale commercial breeding operations, making “The Great Lakes State” a potential safe haven for anyone looking to profit off of the exploitative breeding of dogs and cats. “We don’t want Michigan to become a place that’s attractive for these large scale puppy mill type facilities to want to move here because we don’t have any regulations,” Fritz tells ABC 7 News. “If we had strong state laws regulating these large-scale breeding operations, we could put a stop to this unimaginable suffering,” Fritz explains. To voice your support for the passage of SB 560, visit the Michigan Senate website.